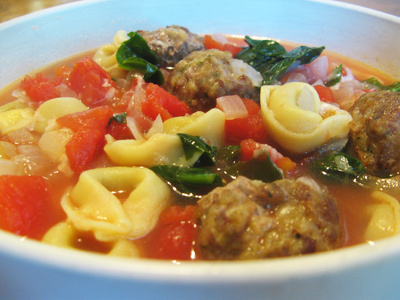 I’ve been looking for new soup recipes and came across a Tortellini Soup and a Meatball Soup that sounded so delicious that I decided to combine the two. This broth based soup is made with tomatoes, spinach, onion and garlic to warm your heart on a cold day. I had no trouble convincing my boys that this was going to be good. They filled their bowls to the rim and in no time at all it was all gone. You learn around here to get it while it’s hot or you might not get any at all. I got out a bag of meatballs from the freezer that I had previously made up. After a couple hours they were thawed and ready to go. 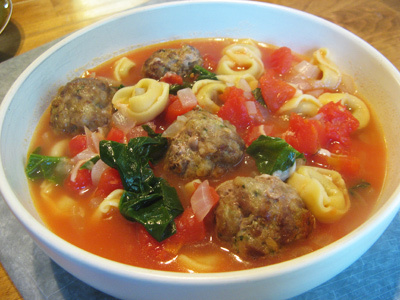 I needed an onion, 2 cloves of garlic, 2 cups of fresh spinach, 1/2 bag of tortellini, 1 can of diced tomatoes, a box of stock, salt and pepper to taste. Plus a little Pecorino Romano cheese over the top. First things first . 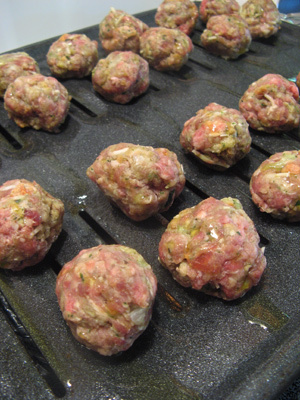 . . place the meatballs on the broiler pan lined with aluminum foil on the bottom pan. Heat the oven to 375 degrees and cook 10 – 12 minutes on each side. Drizzle some olive oil in a stainless steel pot or dutch oven and add the onions. Stir them around over medium high heat until they become soft and translucent. Add the garlic for just a minute more until nice and fragrant. 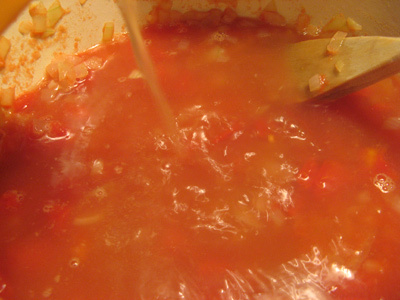 Add the can of tomatoes to the pot and give it a stir. Next, add the box of chicken stock. If you’d like to go vegetarian on this, substitute vegetable broth and delete the meatballs. Turn up the heat and bring to a low boil. 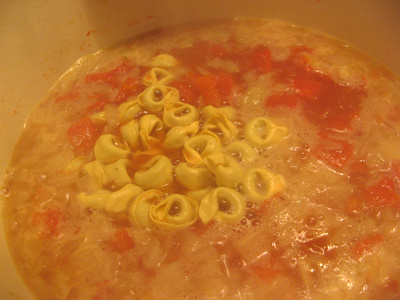 Add the tortellini and cook according to directions, usually around 10 – 11 minutes. I only needed half a bag which measured out to 1 1/2 cups dried pasta. 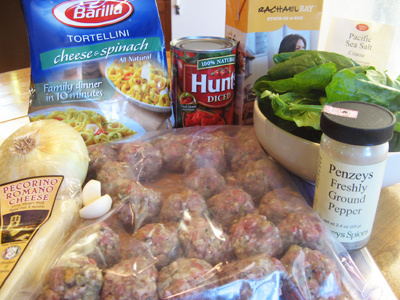 Once the tortellini has cooked, turn the heat down low and add 2 cups of fresh spinach. Give it a gentle stir and it will wilt into the soup. 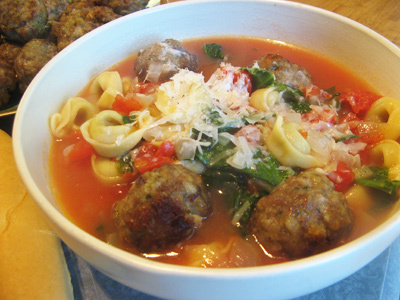 I ladled the soup out into bowls and added meatballs to each bowl. Some wanted a lot of meatballs while I only needed a couple. Mmm, doesn’t that look good, but wait I forgot one more thing. A little Pecorino Romano cheese on top! 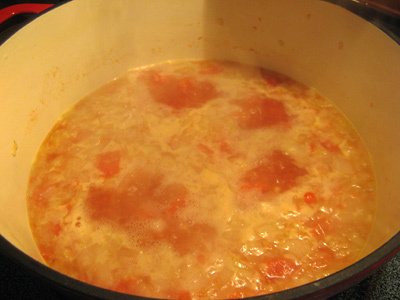 In a large pot or dutch oven, drizzle olive oil and add onions. 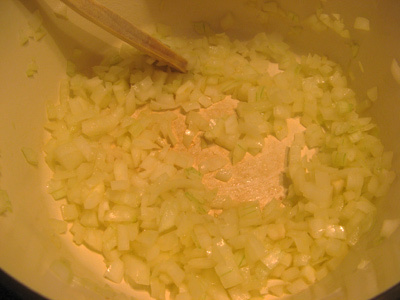 Stir over medium high heat until onions become soft and translucent. Add garlic for a minute more, stirring frequently. 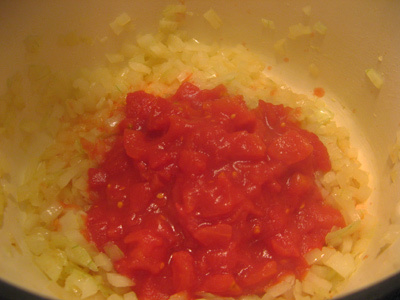 Stir in the diced tomatoes. Add the box of chicken stock and turn up the heat and bring to a boil. Add the tortellini and cook according to package directions. 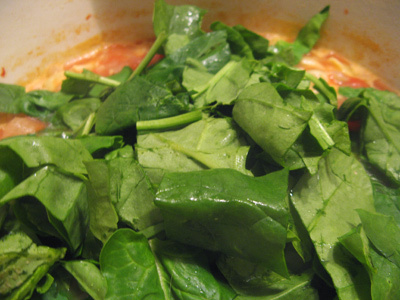 Once the tortellini has cooked, remove from heat and gently stir in the 2 cups of fresh spinach. Spinach will quickly wilt into the soup. Season with salt and pepper. 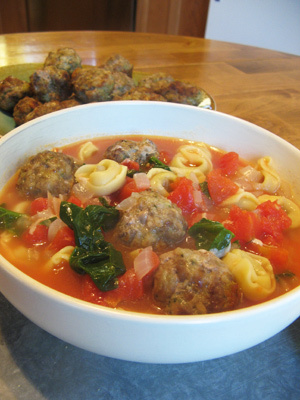 Ladle into bowls and serve with Italian Meatballs and Pecorino Romano cheese if desired.